We all know that networking is important, and that forming relationships with others is a vital part of success. But sometimes it seems like networking removes all emotions from the equation and focuses only on immediate goals, whereas the kind of relationships that have true staying power, give us joy, and support us in the long run are founded on simply liking each other. This book, featuring activities, self-assessment quizzes, and real-life anecdotes from professional and social settings, shows readers how to identify what’s likable in themselves and create honest, authentic interactions that become “wins” for all parties involved. The worst thing we can do when trying to establish a personal bond with someone is to come across as manipulative or self-serving. Authentic connections go much deeper — and feel much easier — than trying to hit self-imposed business card collection quotas. 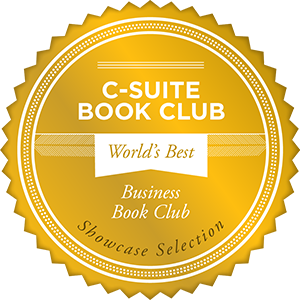 This book presents a new paradigm that shows how even the most networking-averse can network… and like it. Featuring real-life scenarios and packed with activities and self-assessment quizzes, this powerful yet down-to-earth book will help bring to light all of your natural likability — and give you easy, comfortable methods for creating honest, enjoyable interactions that become “wins” for you and for all parties involved. Forming relationships is the foundation of success. Once you discover The 11 Laws of Likability, your road to success in any field will be faster and more enjoyable than you ever imagined. Using the Thinking Preferences Assessment (TPA) you can discover your thinking preferences – that is, which part of your brain you prefer to exercise the most in thinking and learning. Your brain profile gives an indication of how you prefer to communicate, manage, learn, teach, lead, solve problems, make decisions, form relationships and many more aspects of life. Click here to see sample results. I have read Michelle’s book The 11 Laws of Likability three times and I highly recommend this book. I have learned something new each time! Great read!! An Engaging, Practical Guide to Likability. What makes this book different (and better!) than other books on this topic, is that the author grounds her theory of likability in authenticity, and offers readers helpful, introspective exercises to assess their truest selves. I found the writing engaging, and the advice applicable far beyond the workplace. Engaging, insightful and so useful, The 11 Laws of Likability is a must-read for working moms looking to expand their networks and cultivate new allies. And who wouldn’t benefit from some pointers about the best ways to start new conversations? Michelle Lederman’s step-by-step approach starts with preparation before the conversation takes place, takes you through the conversation, and then provides guidance on the relationship-building that can take place afterward. Hers is a no-fail approach. This book is a must-read for anyone interested in increasing their influence and impact. Well organized, captivating anecdotes to illustrate her points, and useful takeaways that are immediately applicable. This book will serve me well in my own growth as an entrepreneur, but also one that I will share with many others. Well done! Read This Book Now!The 11 Laws of Likability is a great and thoughtful breakdown of things we believe we know intuitively, but with a clear and concise science behind them. It will help you reassert and realign the intentions behind your actions. ‘Likability’ is a powerful and often considered intangible component of influence. Michelle Lederman shows that it can be broken down and studied. There are implications here for organizations as well as individuals. This is an outstanding book. It is not only incite-full! but is easy to read and packed full of useful practical tips that just seem super easy to implement and make a real difference. It opened up a whole new vista for me of how networking and relationship cultivation are not just something you have or don’t have but are like dancing, you really can learn the steps. It’s a simple declarative sentence containing only seven words, but it reveals one of the most critically important secrets of business success: People like to do business with people they like.” “In her book “The 11 Laws of Likability,” Michelle Tillis Lederman, an adjunct professor at NYU’s Stern School of Business, provides step-by-step guidance for improving your likability quotient. The core message in this book teaches you to be yourself in every crevice of your life, elegantly bound with respect and realism. Additionally, the importance and strategic gains of networking are communicated. This book is a superb addition to your personal library and it would also make a great gift. But now, having read from virtual cover to cover, (and admittedly, having gone through some of the exercises), I feel like I should make an appointment with myself, and set time aside to go through everything more carefully, perhaps even with a group of people I’m working with. I think it could do some good. I can only compliment how the author works through all of these aspects, teaches finding a workable common ground, and teaches in a multiplicity of ways how to look at and relate to others with compassion, understanding , through unbiased eyes. The 11 Laws of Likability is a well-organized, clearly written book that brings home many potentially eye-opening concepts, all of which are based on the idea that networking can be as enjoyable as having a conversation with friends and still be highly beneficial to career goals. Sometimes self-help authors can’t help but fall into the trap of being overly positive. But not Michelle Tillis Lederman — she knows how to remain balanced. 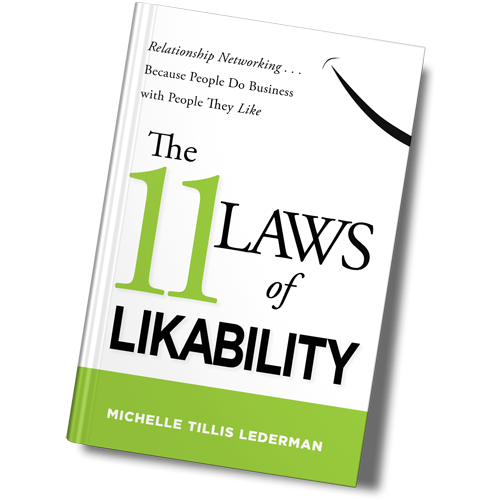 In her book, The 11 Laws of Likability: Relationship Networking . . . Because People Do Business with People They Like, she proves her method simply by the way she writes. Like all business and self-help books, a lot of the advice seems like common sense, especially to extroverts who are good at networking anyway. 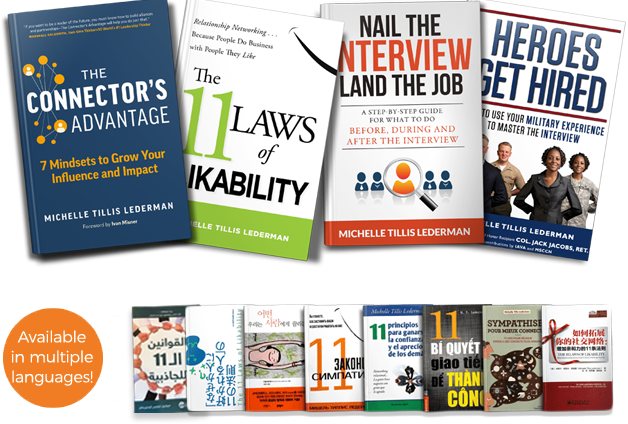 However, taken as a whole, the 11 laws can inspire you to be open to every potential new contact. Lederman does a great job supporting her laws with stories from her personal networking successes.